Sarah Nader- snader@shawmedia.com Nancy Schietzelt, president of the Environmental Defenders of McHenry County, talks with Leland Victory, 5, of Woodstock about water conservation during Saturday's Earth Day Celebration at the Prairieview Education Center in Crystal Lake April18, 2018. The event was hosted by the McHenry County Conservation District and Environmental Defenders of McHenry County and featured live music, guided nature hikes, games, crafts, environmental exhibitors and a recycling drop-off. 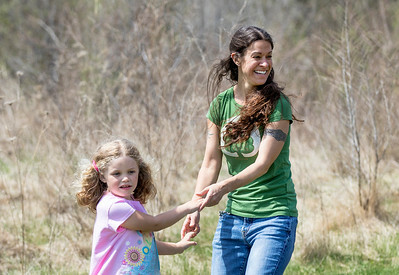 Sarah Nader- snader@shawmedia.com May Thomas (left), 4, of Greendale, Wis., and her mother, Julie Thomas, dance to music while attending Saturday's Earth Day Celebration at the Prairieview Education Center in Crystal Lake April18, 2018. 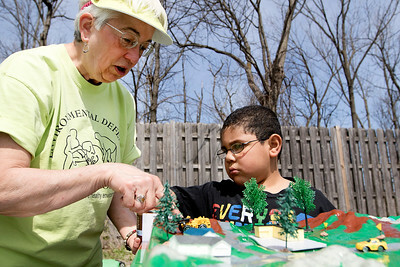 The event was hosted by the McHenry County Conservation District and Environmental Defenders of McHenry County and featured live music, guided nature hikes, games, crafts, environmental exhibitors and a recycling drop-off. Nancy Schietzelt, president of the Environmental Defenders of McHenry County, talks with Leland Victory, 5, of Woodstock about water conservation during Saturday's Earth Day Celebration at the Prairieview Education Center in Crystal Lake April18, 2018. The event was hosted by the McHenry County Conservation District and Environmental Defenders of McHenry County and featured live music, guided nature hikes, games, crafts, environmental exhibitors and a recycling drop-off.